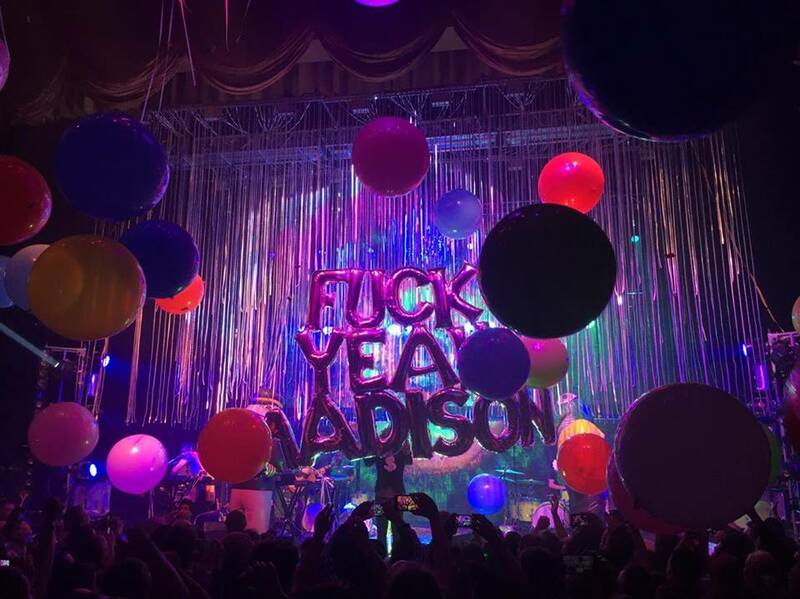 On Friday, The Flaming Lips, who have been a fixture in indie and psychedelic rock since the ’90s, brought their eccentric show to the Orpheum in support of their newest release Oczy Mlody. California-based band Cherry Glazerr opened for this show, bringing their cool pop/rock set to get the audience started. There seemed to be some problems with the sound levels during the Cherry Glazerr set — many audience members were complaining the band was too loud. It seemed the guitar levels were so high it was hard to hear the usually skillful musicality of the rest of the band. 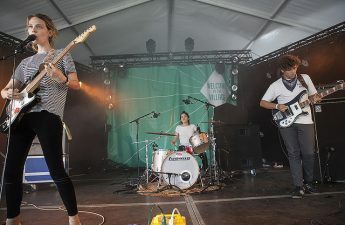 As an opener, Cherry Glazerr couldn’t perform with as many of their usual quirky interjections, such as pulling their pants down on stage, and seemed to be overtaken by such a large stage. Cherry Glazerr may be a better band to see at a more intimate venue where they can exercise their weirdness. But they did seem to have fun, joking around about the chord progression on the birthday song, and were an interesting pairing to go with a Flaming Lips show. The Flaming Lips, on the other hand, are veterans at touring and commanding huge stages from all of their concert and festival experiences throughout the years. Their show was exactly what you’d expect a crazy acid trip to be like, complete with fistfuls of glitter, bouncing balloons, huge mushroom décor, flashing lights, large smiling cartoon figures on stage and even a bejeweled horse. The Flaming Lips kept their 30-year reputation for throwing an insane party going at this performance. Each of the Flaming Lips’ songs was its own gorgeous performance, often requiring both set-up and clean-up and possessing its own theme. The stage was decked out with both an LED wall and LED hanging string lights. 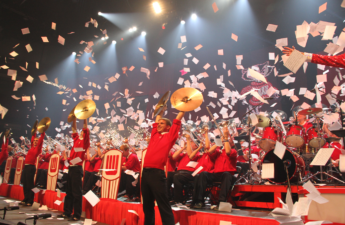 Their set began with the song “Race for the Prize,” which started off the show appropriately with excessive amounts of confetti streaming across the stage, and a huge amount of balloons being released into the crowd. Wayne Coyne, the band’s front man, at age 56, still owns the stage with prophetic splendor. Donning crazy outfits and eyepatches, it is hard not to stare at him and feel his energy. The light show was impeccable, and during some moments of the show The Flaming Lips lit up the Orpheum to be as bright as daylight. In these moments, you could see everyone in the crowd was smiling ear to ear as they danced the night away. Throughout the show, the stage set-ups for these songs consisted of blow-up rainbows, dancing sun characters and aliens. 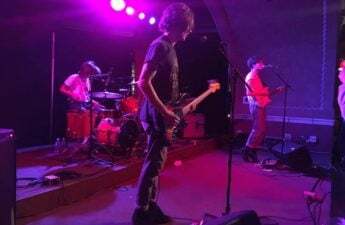 During a new song called “There Should be Unicorns,” Coyne literally got onto a jeweled horse and, escorted by a security guard, made his way through the audience. In the middle of the show, Coyne came out in the infamous hamster ball and sang a cover of David Bowie’s “Space Oddity.” He launched into the crowd, supported by many fans, and made his way to the box at the back of the venue’s general admission area where he finished singing the song, making eye contact with the people crowded around and slapping the ball beneath him. After putting on such an impeccable show, it seemed sort of sad Coyne had to beg the audience to stay and keep the energy up. For those who did, this was a show equipped with every bell and whistle in the book, which made for a gorgeous psychedelic experience at the very least.